In addition to the app development APIs, we also make available a very rich set of administrative and management functions. Every single feature available in Backendless console, is also available via specialized REST API. Whether it is performing a data import/export, setting up database schema or retrieving application’s analytics – all of these can be done with a REST call. These APIs are available for any customer who upgrades to Backendless Plus or the Cloud Enterprise plans. When you decide to upgrade, contact us and request your Admin API manual. Previously I wrote how to change user’s password using Backendless console. Additionally, there are ways to change user’s password using the API. In this post I review the API which can be used to change the password IF a user can login. A different scenario is possible when a user cannot login for the reason that he/she forgot the password. That scenario will be reviewed in a separate post. As application is progressing through its lifecycle, there are different teams involved in interacting with the app and its backend. These teams include developers, testers, security auditors, system administrators ultimately customers and the users of the app. Traditionally, application goes through the stages of development, testing, staging and production. Each stage has its own group of users. It is important that each stage has its backend with all the data, security policies and business processes in an isolated from other stages environment. Backendless provides support for multiple app environments through a feature called Versioning. Login to Backendless Console, select an app and click the Data icon. Select a table that has some records. Click the REST Console tab. The table you selected in step (2) is the context of all subsequent operations in REST Console. Try clicking another table and notice the change in the Request URL field. Make sure a table with at least one record is selected. Click the GET button. REST Console makes an HTTP GET request to the server, receives the response and renders it in the Response Body area. You can also see the request headers if you click the show headers link. In my previous post I reviewed the user registration API. Now that you know how to use the registration API and have a registered user, the next step is to review the login functionality. 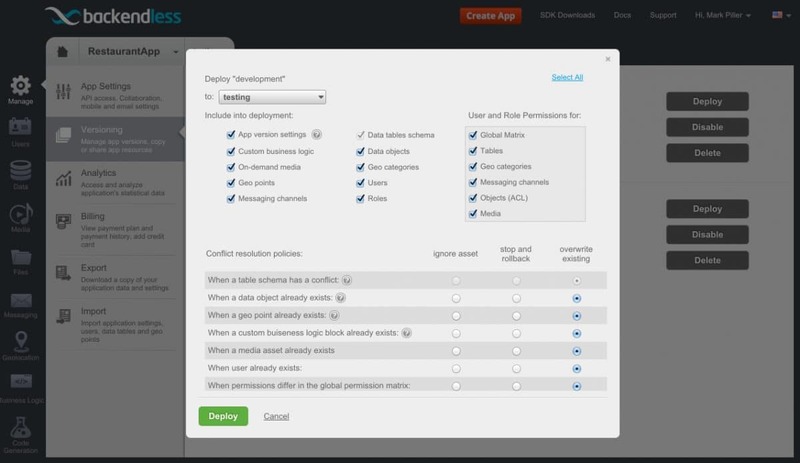 The video below focuses on the apps’ login screen and the Backendless Login API. Login to the Backendless developer console, select an app and click the Files icon. Navigate to the file or directory for which public access should be denied. Click the lock icon to switch to the Security screen. Click the Roles Permissions menu. In the video below I review the code for the User Registration screen of the RestaurantToGo sample app. Additionally, I discuss the usage of the Backendless Registration API. In the previous post and video, I reviewed the process of setting up the development environment for the application.